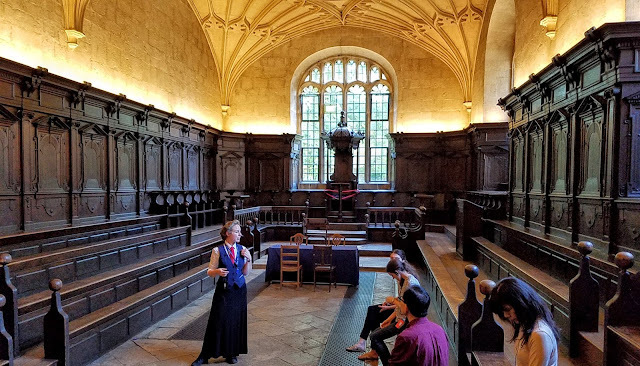 Guide Fiona in an oak-paneled room of the ground-level, former Divinity School at Oxford University's main building of the Bodleian Libraries. Photos are not permitted on the Humfrey Library level, discussed in this post and featured in Harry Potter's Hogwarts. Today I had the extraordinary experience of touring the main, historic building of the Bodleian Libraries at Oxford University, UK. Here's some of the intriguing and tragic history shared by my capable guide, Fiona (a knowledgeable academic, whom I wish I could identify more precisely; Fiona, get in touch if you read this, and I shall give you due credit). To get the most important matter out of the way at the top: Yes, this is the place were books literally were flying about the room at Harry Potter's Hogwarts. Fiona told a couple of good stories about filming in the library, which was permitted only during, and ran fully throughout, nighttime closing hours, 7-7. Sometimes filming had to be stopped on Harry Potter if sound booms got too close to the ceiling beams, or lights raised the temperature too much for the books' safety. On another occasion, Fiona asked a bearded guy, authorized to case the library, why?, and he answered, "For the next Transformers movie." Only later did she realize she had spoken with Steven Spielberg. She still wasn't sure why the library would make an apt set for Transformers. So I'll skip the fascinating mechanics and history of care for the books--let Fiona have her IP, and you should take the tour, at least the 60-minute version, yourself--and mention just one arresting, contemporary fact: Fiona said it takes on average £20,000 pounds to scan one book from the historical collection. So feel welcome to donate in support of the effort. What's here that's worth such extravagant effort? Fiona casually mentioned the presence of an original Johnson dictionary among the holdings. In the 15th century--the dawn of the printing press, remember--Fiona said, one book cost about as much as a small car today. The University library owned the princely sum of 20 books. In the 16th century, Oxford got a massive donation of books from Duke Humfrey (Humphrey of Lancaster, first Duke of Gloucester), but had no place to put them. So the library asked for some additional money from Humfrey to build the structure I was in today (but just the second floor; the Divinity School was on the ground floor and today is part of the halls still used for Convocation; it was and remains--with modern climate controls precluded in the name of historic building preservation--unwise to store books on the ground level because of the risk of rat and insect infestations). Today if someone who has the proper credentials wants to see a book from this old collection, he or she must request it in advance, and then is given a date, time, and place to view the book. The book is then transported via underground tunnel across Broad Street to the more recent Watson Library (opened originally 1940s, renovated and reopened 2015), to meet its reader at the appointed time and station. Yet these are not the original books of the 15th century. In the 16th century, the entire contents of the library was (believed) burned in the name of the Reformation. You can still see where a stone cross was removed from the wall. The stained glass windows, featuring Catholic iconography, were destroyed and today still are just plain clear glass. Some 40 or 50 (more?, it is suspected) books are known to have survived the burning, besides pages here and there (some lathered with butter, as they apparently were recycled by fishmongers to wrap their wares). The library has managed to buy back five--5! (or just three, Wikipedia says). See, fire, such as the burning of candles even for the innocent purpose of generating reading light, always and still poses a grave threat to the library. But that threat is second, Fiona said, to the ravages of water, which might be needed to put out a fire. Mold begets hungry bugs, who don't stop when they reach paper. Not even bottled H2O is permitted to today's readers, who must exit the library to slake their thirst. Shhhhh! Silence in the stacks, please.